The best part about living in a country like India is the diverse culture. If you are staying in an apartment, you would surely have a Gujarati, Punjabi, a South Indian and probably a Bengali neighbor. So whether it’s Navratri, Durga Puja, Lodhi or Onam, you are sure to get some delicious local delicacies. This ritual has become pretty common now a days. Being in Hyderabad for over 2 years know, I learnt about the local festivals like Bhatukhama, Bonnalu to name a few. However the one festival I never thought Hyderabadis would celebrate at such a grand level was Ganesh Chaturthi or Vinayak Chaturthi as it is known locally. I was staying at a local PG when I first came to Hyderabad and it was during that time I realized that how popular this festival here is. Every PG here had either a photo of Lord Ganesh or a big idol and we used to move from PG to PG to see the idols. Here’a an old post talking about my experience of Ganesh Chaturthi in Hyderabad. Ganesh Chaturthi is widely celebrated in the western part of India and Mumbai is at the heart of it. Ganpati Bappa is at the start of everything, so it’s pretty much like “Hum jahan khade ho jaate hain, line wahin se shuru hoti hai” and now you know who used this dialog first 😉 Jokes apart, Anything new in India especially among the Hindus has to begin with Ganpati Bappa as we believe it’s auspicious. Ganpati Bappa, I feel is one of the most friendly one. Having featured in many movies, Ganpati Bappa is loved by one and all especially children. Huge statues of Lord Ganesh are placed in big pandals across the city. And during these 10 days, many people go pandal-hopping to get a glimpse of their Lord in a different avatar. Ganpati Bappa takes a different avatar every year and every idol is unique in its own way. I remember seeing a ‘geek‘ avatar of his in Ahmedabad where he was on a cruiser bike with mobile in his hand. But I guess after the Bahubali Ganesh, probably Kabali Ganesh will make way this Ganesh Chaturthi. Any festival in India is famous for the associated sweets with it and Ganesh Chaturthi isn’t any different. Lord Ganesh’s favourite food, Modak floods the market as everyone relishes it. So the 10 days are going to be a carnival with food, fun, masti and devotion. No matter where you are in India, Ganpati Bappa is set to take center stage now. Next Can Foodies be Vegetarian ? Yes ! lovely post, My Ganesha is always eco friendly and I make him myself. This year I have put some seeds into him, he will help my veggies grow!! 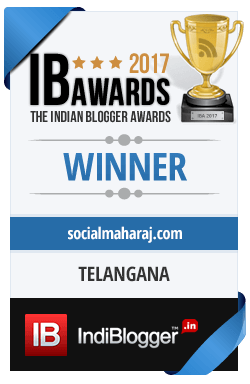 Lovely post…I would love to read more about how the festival was celebrated in Hyderabad. Completely agree with you on staying in an apartment and witnessing all the festivals..I love it here in Bangalore where I also learned about so many new festivals after coming here..good one!